Summer time is finally here and time to get those outdoor toys out! 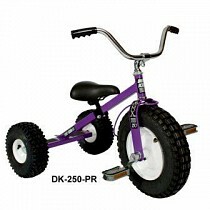 When my kids were growing up their favorite outdoor toys were their tricycles and bicycles. They would ride around the neighborhood for hours just stopping long enough to get a Popsicle or a drink. Riding bicycles is great exercise for kids and FUN! There are a lot of benefits to writing a bicycle it helps develop strength, balance and overall fitness. Bicycles aren’t the only fun outdoor toy there are so many different games and toys. Fling-A-Ring is a great backyard game for kids and adults. Fling-A-Ring is a cross between horseshoes (except light and safe), disc golf (without needing a course), and the good old fashion “Jarts” (minus the sharp points and lawsuits). Research shows children should be actively playing at least 60 minutes a day. Spending time outdoors raises levels of Vitamin D which helps protect children from future bone problems, heart disease and other problems. Outdoor play lowers a child’s within minutes of seeing green spaces. I thought that was really interesting I know at least 4 of my grandchildren’s favorite color is green. The average American child spends 44 hours per week (more than 6 hours a day!) staring at some kind of electronic screen. That’s just crazy! We need to get our kids and grand-kids out playing, using their imagination instead of being dependent on TV, Video games, IPads and so on! American Made Learning Toys that are fun yet educational. Playtime for kids are like our work time, so we want them to have fun but learn as well. I love to sit and watch my grand-kids play. They get real serious sometimes in their play. 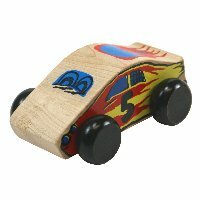 AmericanToyBoutique.com has so many American Made Learning toys. The Amazing Tracker is fun and entertaining for toddlers while teaching them to gasp and release the ball. The visual tracking helps child to learn to how to predict the path of an object. The Amazing Tracker has won 2 Awards Oppenheim Toy Portfolio and Best Of School Supplies Four Gold Stars (Best Toy For 24-36 Months). 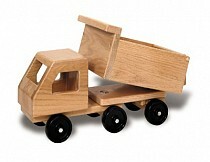 Wooden toys last so much longer then plastic cheap toys. This is just one of the many Learning Toys AmericanToyBoutique.com carries. The Sound Cylinders helps develop auditory discrimination skills required for language acquisition and helps develops evaluation thinking skills when making “same as” and “different than” decisions. 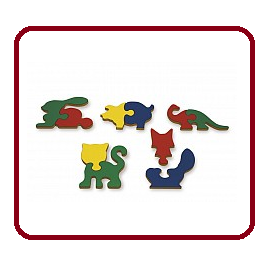 The Animal Shape Puzzle features five separate animals: a rabbit, pig, dinosaur, cat and fox. They are made of high impact laminate surface makes them durable and washable. It comes with a handy storage bag which makes it a perfect travel toy. I know my grand-kids love bags to take their toys different places. 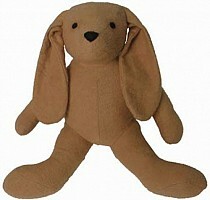 Check out AmericanToyBoutique.com’s category Educational for Kids has these and a whole lot more. Easter is almost here and AmericanToyBoutique.com is giving away Free Personalized Easter Letters for anyone who likes their Facebook page. 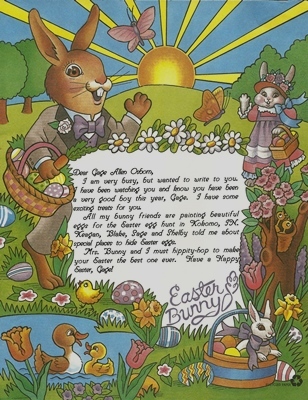 Kids enjoy getting mail and especially from the Easter Bunny! Offer only good until Monday 3/25/2013. What is Made in the USA? I remember growing up playing Checkers with my dad. He usually won but it was fun just hoping to beat him, plus spending the time with him. My brother would get so mad when dad would win (which was most of the time) he was not a very good sport. I don’t think he ever really grew out of that. It was always fun though. 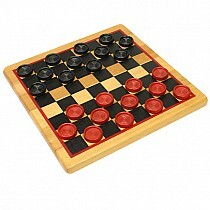 I wish more kids played the simple games like Checkers. There are so many video games they would rather play and a lot of them are fun but it’s just not the same as sitting down having the interaction with another person. A simple game of Checkers can stimulate the brain development in younger children and promote healthy brain function in the elderly. Checkers requires a lot strategy to be good at it. You have to try to figure out where your opponent is going to move next. So many questions to ask yourself. Which jump is best for me? How can I get a double jump? Where is my opponent going to move next? It can be mind boggling! Thinking like this kicks your brain into overdrive and will force critical thinking. Most children that have been exposed to this kind of thinking at an early age show more potential in school. Young or old everyone can appreciate a good game of Checkers its one of the best games to play. Go get your old Checker set out or go to www.AmericanToyBoutique.com to purchase an American Made Checkers Set that with last a lifetime. 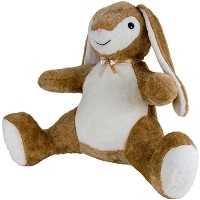 We are always looking for toys that aren’t just fun, but are educational for our children and grandchildren. Children love books and like to be read to. Sesame Street has some great personalized books. There fun to read and kid’s love seeing their name in a story. They help teach various things. 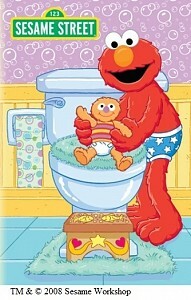 This Sesame Street Bye Bye Diapers is great to help potty train your child it talks about how Elmo learned to be “go” in the potty. There are so many great toys that are learning toys but fun also. My youngest grandson loves learning new things he is three and at a perfect age to learn. He really gets in the video games which we all know they will have to learn a lot of that stuff in school. I would much rather him just play with his cars and trucks. Did you know the first three years are the most important in shaping the child’s brain architecture? Children learn more quickly during their early years than at any other time in life. Isn’t that amazing? 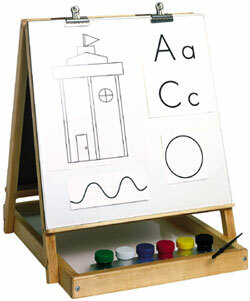 Learning toys are a great way to teach them in their early years. American Toy Boutique carries a lot of those toys that help with learning how to sort items by size, shape and color. 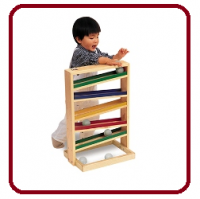 Help them develop visual perception and discrimination skills. Babies and young children grow, learn and develop rapidly when they receive love and affection, attention, encouragement and mental stimulation, as well as nutritious meals and good health care. It takes a lot of love and attention to raise a little one but there is such a great reward…from a smile or a kiss or a hug or just an I love you it is one of the most rewarding jobs I have ever had! Hope everyone had a great Thanksgiving I know we did. We are having 10% off sale at www.AmericanToyBoutique.com if you use the code ATB26 all day!!! Support American Made! !